Barry Moser’s Frankenstein illustration is on display of the lower level of the Harold F. Johnson Library building on the campus of Hampshire College Tuesday, July 5, 2016 in Amherst. 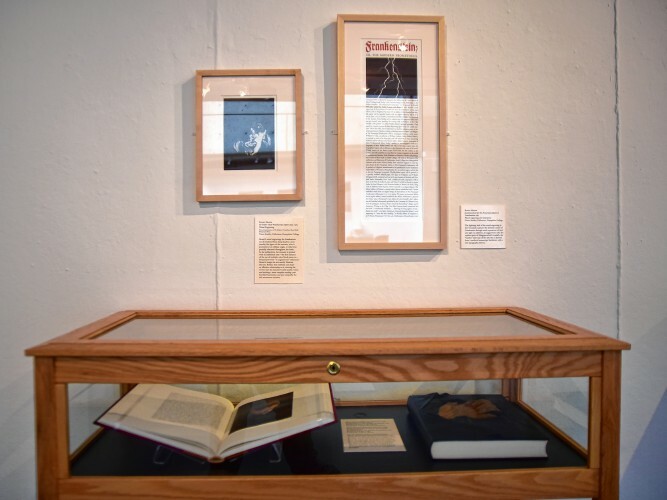 The library is pleased to share a review in today’s Daily Hampshire Gazette of the summer exhibition titled Design & Build: The Art of the Book! We are proud to see the curatorial work of our Gallery Director Amy Halliday and Kress Curatorial Fellow, Jocelyn Edens 06F, and recent Hampshire grad Rhana Tabrizi recognized! Special thanks to Cathy and Leon DeForest who generously gave the collection to Hampshire, to Vance Studley for so kindly sharing Barry’s work with the world, and to Barry Moser for being a wonderful collaborative partner on this exhibition and for supporting the Hampshire College Gallery and the Harold F. Johnson Library.